Californians will soon be able to identify as non-binary, marking their driver's licenses and birth certificates with an “X” rather than the traditional “M” or “F” under a bill from State Senator Toni Atkins (D-San Diego) which was signed into law by Governor Jerry Brown back in October. The new law was designed to offer a gender-neutral option on state documents for those who are transgender, intersex, or those who do not identify as male or female. It defines the designation of "non-binary" as an "umbrella term for people with gender identities that fall somewhere outside of the traditional conceptions of strictly either female or male." The law will take effect on September 1st, 2018 and will also make it easier for people to change their gender identity on official documents by removing the requirements that individuals must undergo clinical treatment or get a court order before they can make the changes on their birth certificates, driver licenses, or other official documents. 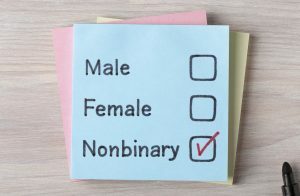 Research from The Williams Institute at UCLA has demonstrated that non-binary workers feel pressure at their job when it comes to their lack of gender designation. 23 percent of those polled said that they purposefully hid their non-binary status in the workplace. Of those who do publicly identify as non-binary, almost 20 percent believe they had lost a job because of their status, while an astounding 90 percent believe they have suffered some form of job bias, discrimination, or harassment. While Oregon and the District of Columbia have already begun to allow non-binary designations, with California following closely behind, there hasn’t been any talk on the federal level. Federal courts have also yet to include non-binary designations as a protected category in cases involving Title VII or other gender-related discrimination statutes, but many other courts have found a violation of law in situations where employers treated workers poorly, based on inappropriate gender stereotyping. So while there are not currently many cases that are specific to non-binary employees, there is still a risk of legal liability regarding adverse action against an employee because of their non-binary status. Regardless of current legal obligations, employers need to be proactive in developing a strategy for addressing issues arising from an employee who prefers to be designated as non-binary. Typical problems in the workplace reported by non-binary persons include; non-acceptance, transphobia, harassment in the form of incorrect gender assumptions, and intentional misuse of preferred pronouns. Update your managers and supervisors to make sure that they are aware of company policies with respect to non-binary individuals. Consider additional harassment training review for employees. Revise your employee dress code to eliminate gender-related restrictions. Rather than categorize dress code rules by gender, put in place simple rules for professionalism that cover all employees. Determine whether you have appropriate bathroom facilities, or if you need to create private, safe unisex facilities that are available to any employee at any time. This is certainly new territory for many Employers and employees, but as new laws are put in place to support LGBT workers and community members, it’s up to employers to make adjustments accordingly.